A horde approaches. All googly eyed, mouths agape, rotting teeth, and the stench! Oh, the stench! The stench is…it’s just so…wait. They actually smell pretty amazing! Like a pizza shop. But of course they do, they’re ZOMBERONI PIZZA FACES! Homemade pepperoni eyes, cashew cheeze sauce, pepper mouth and caper teeth. What’s not to love? Oh right, the fact that they will tear you from limb to limb leaving only a bloody oven mitt in the middle of the kitchen floor. ~I make my own vegan pepperoni, but you can, of course, use store-bought. Sausages will work, too! ~I used baby bell peppers for the perfect sized mouths. If you can’t find any, just fashion together two rounded bell pepper slices to create the mouth. ~It’s really difficult to eff this up. I mean, how can you? It’s a zombie! But if you like, practice making pizza faces on a plate before going the whole way on the english muffin. ~Unfortunately, the most famous brand of English muffin is not vegan. SAD FACE! But there are plenty of wonderful vegan varieties out there. I actually used a nice healthy sprouted grain English muffin from Ezekiel bread and it tastes faboo. ~For time management purposes, make the pepperoni a day in advance and remember to soak your cashews overnight! These will come together in a flash. Before mixing your ingredients, get the steaming apparatus ready, bringing water to a full boil. Have ready 4 square sheets of tin foil. In a large bowl, mash the beans until no whole ones are left. Throw all the other ingredients together in the order listed and mix with a fork. Divide dough into 4 even parts (an easy way to do this: split the dough in half and then into quarters). Place one part of dough into tin foil and mold into about a 6-inch log. Wrap dough in tin foil, like a tootsie roll. Don’t worry too much about shaping it, it will snap into shape while it’s steaming because this recipe is awesome. Place wrapped sausages in steamer and steam for 40 minutes, until firm. Remove from steamer and let cool completely before slicing. You’ll only need two of the pepperoni for this recipe. Add all of the white sauce ingredients to the blender and purée until completely smooth, anywhere from 1 to 5 minutes depending on the strength of your machine. It’s rather thick, so definitely scrape down the sides with a rubber spatula often to make sure you get everything. Split the english muffins in half and spread them out in front of you. Spread a few tablespoons marinara on each muffin. Tear a basil leaf into small pieces and scatter over the marinara for a rotting flesh effect. Spoon on cashew sauce in kind of a swirly way (see video above). Place two thinly sliced pepperonis where eyes might be, and place two thinly sliced olives in a googly sort of way. Place a thinly sliced pepper for the mouth, with a few rotting caper teeth inside. Arrange on a baking sheet and bake for about 10 minutes. Now your zombie is complete. Proceed with caution!!!! Haha, the kids are gonna do what they’re gonna do! Sweet! Pepperoni recipe that isn’t low fat. 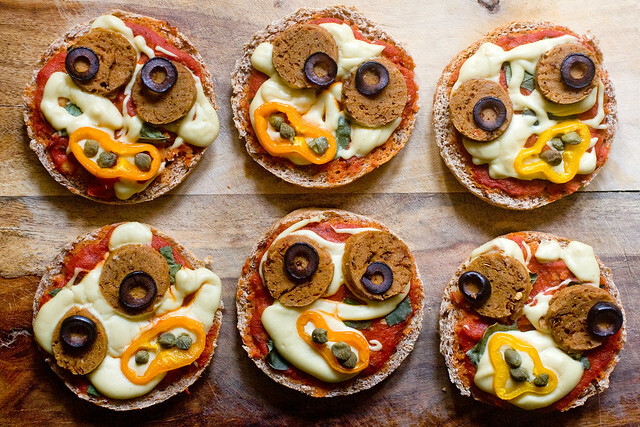 English muffin pizzas ahoy, just like my childhood. You’re wonderful, Isa! OK Isa, I’m convinced you just always have a bowl of cashews soaking. I have your books and still end up googling the recipe when I’m in the store because I’m bad at planning. I made a simliar recipe last year and posted a link on my blog. I did “Creepy Pizzas” and “veganized” a sponsor’s recipe using Daiya and store bought pepperoni and made them look like creepy ghost faces. I love cute Halloween food! That looks amazing. “Astro Zombies” playing in the background his hilarious, and a such a coinkydink (sp?). Besides friends who used to cover that with mastery, another friend is probably going on tour with Danzig. Sorry…the world is small. Nice! I typically don’t like faces on my food, but rock on! I have been a big fan of you for a long time, but this is my first time writing. Please check out my blog at http://autarchickchick.blogspot.com/ . I would be totally honored if you did. It’s still forming, but I still have some cool stuff there. I love pizza,I love to try new things, really it looks awesome, can’t wait to eat this. I love it!! Especially how this is very hard to eff up. Do you have a recipe for vegan pepperoni? Yes similar to mozz and the Italian sausages. It will work on a big pizza very well! The video is wonderful! I love the look of these. Where is the plate from (go vegan)? Thanks. Does anyone know if you could use a pressure cooker instead of a steamer for the pepperoni? I love my pressure cooker – cuts down so much time (and uses less energy for a happy planet). I’m still trying to figure out the time conversions for things not in the manual. Maybe I’ll just experiment! looks too good to wait until Halloween! question: do the cashews need to be soaked before they are boiled? i have never had to boil cashews before. thanks! Planning on going veg in the coming month. 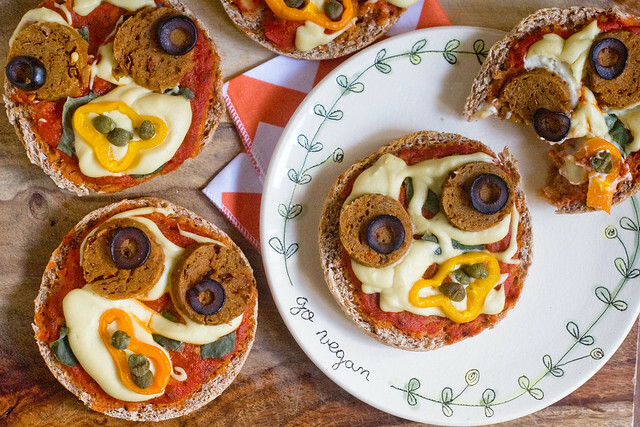 I just want to make a horde of vegan pepperonis right now and put them in my freezer. I’m really enjoying your blog, I found it on a website for newbie vegetarians. 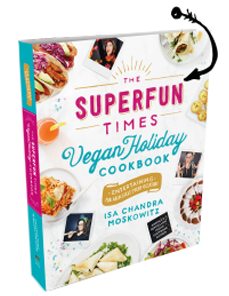 I know this post is ages old, but I always use a pressure cooker when making vegan sausages. They do not burst open. If the sausages are to cook for 40 minutes, I usually cook them for 10-12. I read this as a zombie pizza. haha. but for thanks for sharing, I love the post especially the picture of the pizza. It’s unique! Tasty and cute i love pizza!